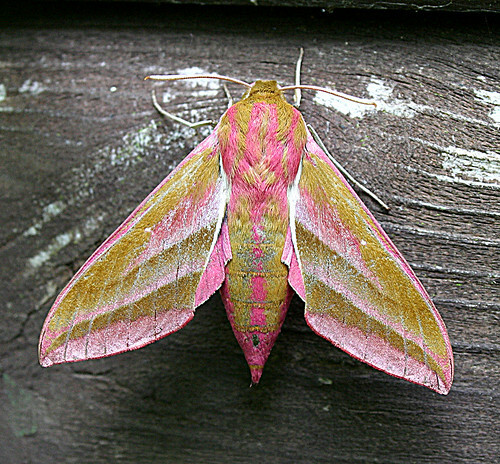 This strikingly attractive Elephant Hawk-moth Deilephila elpenor was the first of the year trapped at Tophill Low NR, East Yorkshire during the final weekend of June. 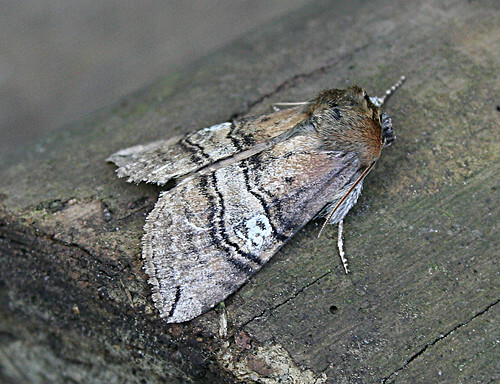 Mild nights ensuring plenty of variety was attracted to light despite individual species totals remaining low. 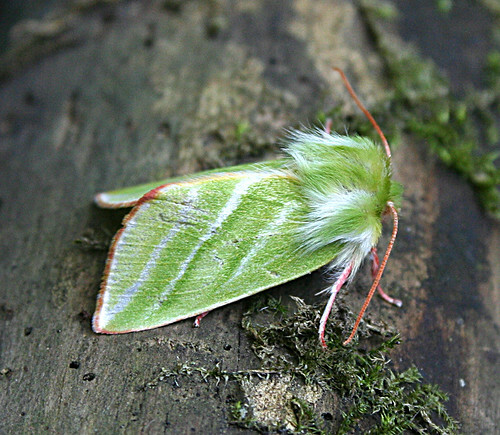 Traditionally, the middle of the year can produce a delightful selection of species – here are some of the prettier ones that are impressive on the eye. 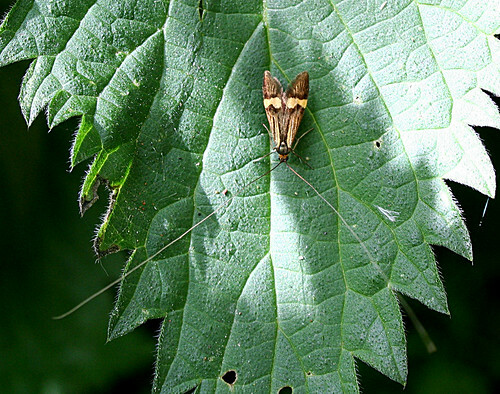 Walking around the site, the stunning Nemophora degeerella can be seen resting on the nettles and doesn’t prove to be difficult to spot. 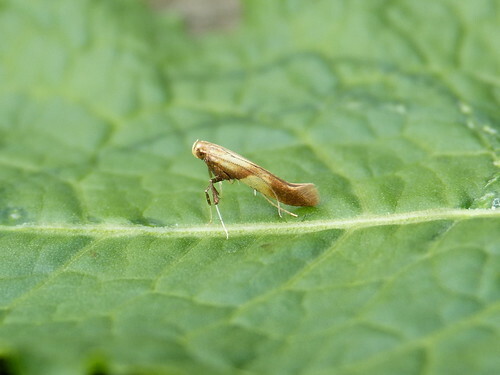 New species continue to be added to the list – a Bucculatrix nigricomella trapped on June 21st may well be the second VC61 record, while Caloptilia robustella was trapped on the 28th – both photographed by Doug Fairweather. 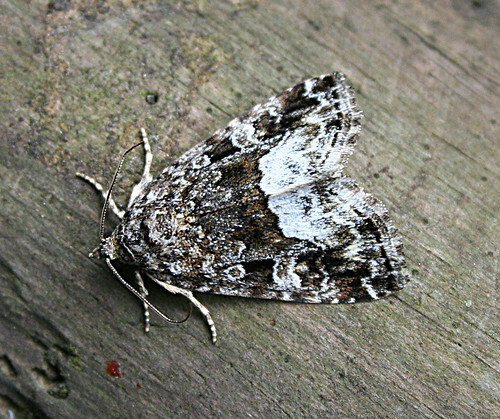 This Marbled White Spot Protodeltote pygarga trapped on the 29th was the second site record, while the fourth Scorched Wing Plagodis dolabraria in Tophill history was trapped on the 21st. 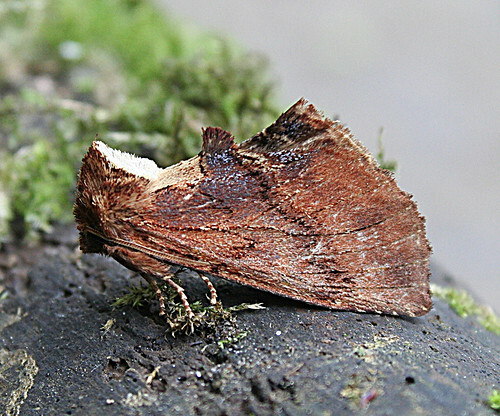 Another surprise was the reappearance of Chimney Sweeper Odezia atrata on the 29th – almost a decade after the last documented site record. 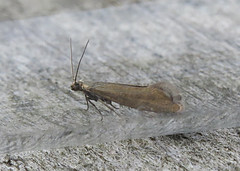 A Red-tipped Clearwing Synanthedon formicaeformis was seen briefly on the 30th, following two on the 29th. Butterflies meanwhile continue to be almost absent. However, Ringlet Aphantopus hyperantus and Meadow Brown Maniola jurtina are now on the wing, while Common Blue Polyommatus icarus and both Large Skipper Ochlodes sylvanus and Small Skipper Thymelicus sylvestris were noted as June drew to a close. The Purple Heron Ardea purpurea found earlier in the week was seen on Saturday. 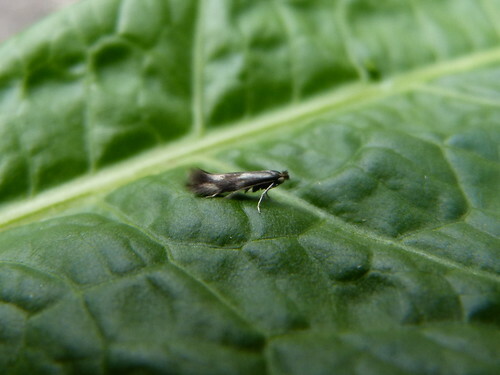 A selection of fantastic pictures can be seen on the official Tophill Low website. Another June surprise was a flock of 45 summer-plumaged Black-tailed Godwits Limosa limosa that dropped out of the sky calling and circled the southern end of the site for several minutes before heading south. Other highlights included Hobby Falco subbuteo, Green Sandpiper Tringa ochropus and a 1st summer Little Gull Larus minutus which still remains, while the regular Cetti’s Warbler Cettia cetti and several Marsh Harrier Circus aeruginosus were once again encountered. 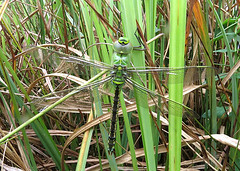 For more news on these, again check the Tophill Low website. 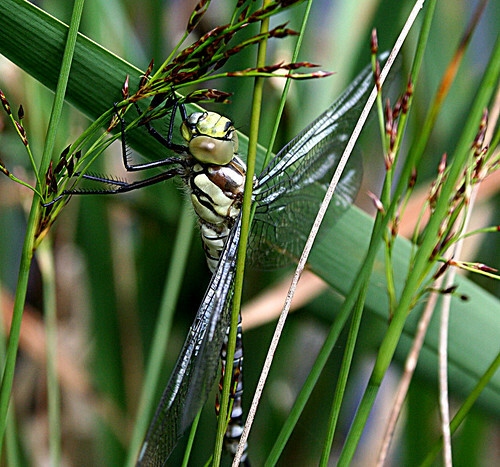 The Odonata season continues – the first Southern Hawker Aeshna cyanea of the season was noted on the 22nd and this was followed up by a count of 10 pre-flight individuals on the 28th, while another 11 exuviae were collected. 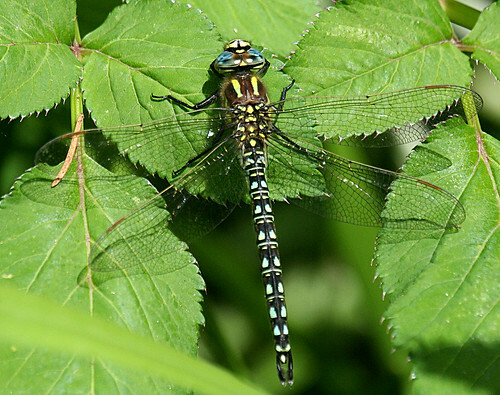 June’s final two weekends also saw several Hairy Dragonfly Brachytron pratense recorded, while small numbers of Emerald Damselfly Lestes sponsa and Black-tailed Skimmer Orthetrum cancellatum are now on the wing. 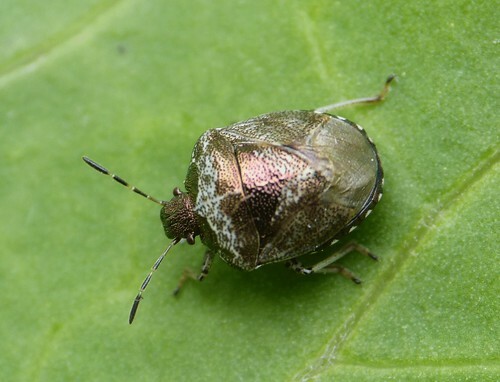 Despite being difficult to find so far this summer, it is possible to find Shieldbugs – Doug Fairweather photographed this Woundwort Shieldbug Eysarcoris venustissimus – the latest addition to the species list. 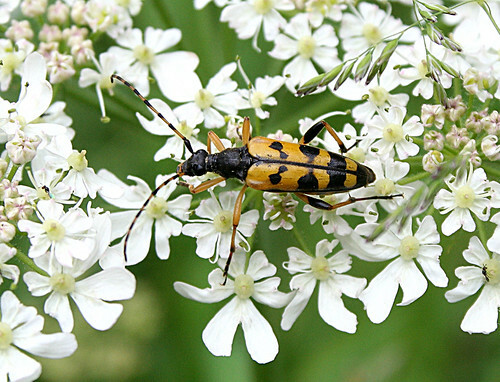 The commonest longhorn at Tophill – Rutpela maculata Black and Yellow Longhorn – was seen in small numbers as the month ended, while Agapanthia villosoviridescens Golden-bloomed Grey Longhorn continues to be present in low numbers. 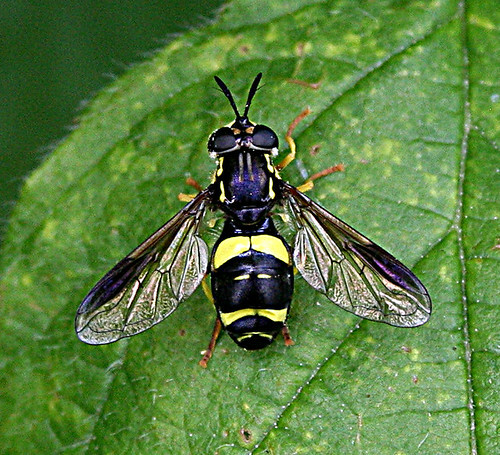 More hoverflies can be seen now with Episyrphus balteatus appearing to be everywhere. Some stunning Volucella pellucens are on the wing, but the best looking species encountered in the last fortnight was this Chrysotoxum bicinctum. 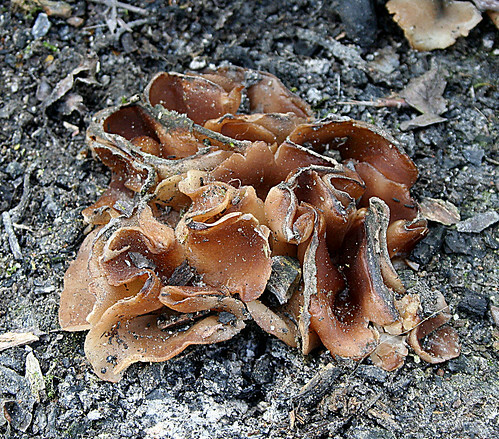 The dry conditions mean that there isn’t an abundance of fungi to see – so it was fortunate Doug Fairweather picked up this Charcoal Cup Peziza echinospora. As I’ve admitted before, I know almost nothing about flowers. 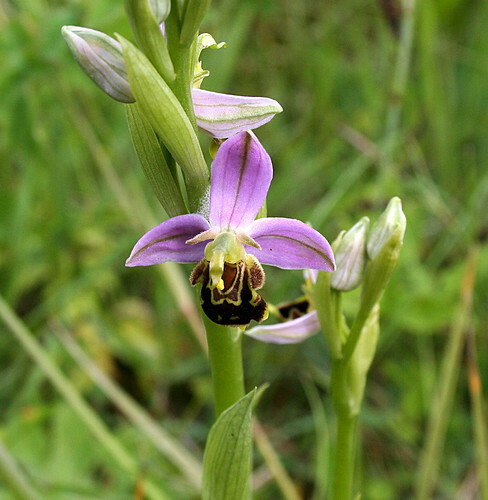 However, it is impossible not to see the incredible number of Orchids in bloom at the moment – this one of the many Bee Orchid Ophrys apifera that can be seen.